American Horror Story Costume Contest? Why Not! I’ve talked a bit about my desire to cosplay here. I’ve also talked about my complete, blistering, utter failure at even the feeblest attempts to cosplay–and featured actual, real cosplayers here on the blog to make up for my epic failure. I think cosplay and costume/clothing design is so amazing, and I am always blown away by the amount of skill and creativity the cosplay and design communities have. So when I heard that the twisted minds behind one of my favorite shows, American Horror Story, were hosting a costume contest to celebrate the show’s October 8th premiere, I got excited. I’m a huge fan of the horror genre, from the good to the craptastic, and American Horror Story is far from craptastic. If you haven’t ever watched the show, I highly recommend it. Each season centers on a different “horror story”, starting with the Murder House, then Asylum, Coven, and this upcoming season will be Freak Show. Though I must warn you, while this show is completely amazing, and one of my favorite ventures into weekly horror, this show is messed up. Seriously messed up. One of the coolest things that the psychos masterminds behind AHS do to get us pumped for the premiere is dream up various ways to pull in the audience. When the first season premiered, people could sign up for a “house call“, where Rubber Man would show up at your house, unannounced, and terrify you from the comfort of your own home. They’d pay you back for scaring the crap out of you by offering a tour of the Murder House and a fancy dinner. 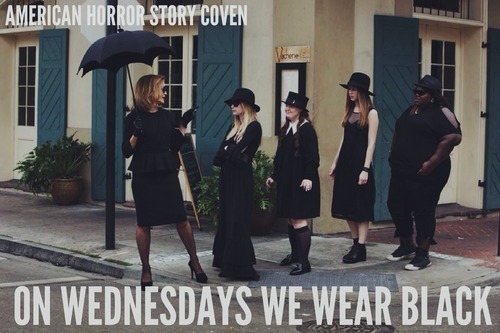 During Coven, you could submit pictures of yourself all in black, because sometimes starting a Mean Girls–American Horror Story mashup meme is too much to resist for even the strongest among us. So like I said before, for Freak Show, they’re doing a costume contest. To my cosplay, crafty, sewing readers, this is your time to shine, loves. The contest, which is open now until October 8, is asking for folks to submit their best ghoulish, weird, unusual, freaky designs inspirations. The designs will be judged by the Emmy Award-Winning costume designer for AHS, Lou Eyrich, fashion designer Christian Siriano, and FX Network exec, Stephanie Gibbons. If you win, you get $5,000, your garment is created and worn by a model in a creative AHS-style photo shoot. This is all about pure creativity here, where we (okay, I) can be uninhibited by our (okay, my) complete inability to sew a single stitch without things getting out of hand. I won’t lump you all in my poor sewing camp. All in all, this contest is all about letting your imagination run completely wild. Like, dance number in the middle of an insane asylum wild. Submissions are being accepted through October 8th. You can view the official rules here, and the contest website is here. If you enter, definitely let me know in the comments! Just putting the finishing touches on my entry and sending tonight. I may not win, but I have sure had a ball with this. I’m dying to see the entries, but so far have only found a couple online. Maybe after the deadline… Good luck to you!